You are here: Home > The Nexus’ (Both One And S) Receive Updates, Or Is It Nexii? The Nexus’ (Both One And S) Receive Updates, Or Is It Nexii? Not to be outdone by the Samsung Vibrant update, both the Nexus one and Nexus S are received updates last night. For the Nexus S, firmware 2.3.2 fixes the SMS bug and random reboot bug that have been reported. You can of course wait for that over the air fix or follow the manual install steps below! Hold down the VOLUME UP button and power it back on. Use the volume keys to navigate to recovery and press POWER to select it. When you see the “/!\” symbol, hold the POWER button and then press the VOLUME UP button. Find the update file (GRH78C-from-GRH78) on your sdcard and then press the POWER button to flash it. Nexus One owners take note, this small update also reportedly squashes the SMS BUG which has been widely reported. Firmware 2.2.2 looks like a minor update and without the release notes we can’t be sure exactly what else is fixed. Still, updates are good and you can wait for the OTA update to hit your phone or follow the manual install steps below! Thanks to the boys at Androidandme for putting together these manual install guides! ← How To Install Froyo On Your Vibrant! When is the Nexus One getting 2.3? Why send a 2.2.2 when they can just send us 2.3? they are probably still trying to fix it. Gingerbread was built upon the hummingbird processor and they are trying to get it to work with a snapdragon I can’t imagine it being a easy port with that factor alone. Good look David although I think I’m a wait for the OTA just to see how long it would take to get to me. 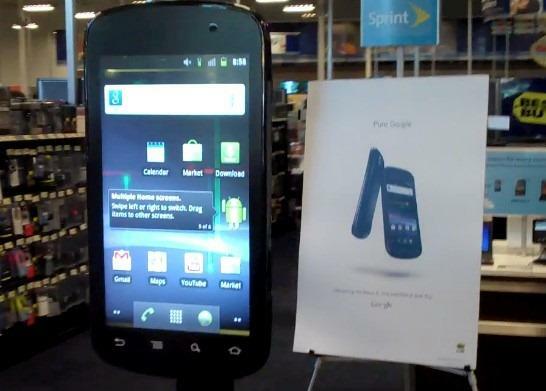 Can you interact with that huge Nexus S??? Anyway hooray for Nexuses (Nexii)! Yes you can. Best Buy set it up. It is a giant, multitouch display connected to a real Nexus S.
You can most certainly add an apostrophe to make a word plural, if the apostrophe is followed by an “s.” In the case of the headlined, the apostrophe is meant for plural possession (written correctly by David). When the next nexus? This one sucked. how much you selling it for then? So why can not Samsung/T-mobile do the same with the Vibrant vs. the complex Kies way? I could have just now noticed it, but after installing I have a NEW ANDROID MARKET! Maybe it was there before, but I just noticed it now. Neato sweeto. Can I do this on my HTC G2?? NO!!!!!!! you will brick your phone. just look the web for custom roms if you want to do that. just know it voids your warrenty (most likely) or wait for an update, or even download a launcher from the market (like adwlauncher) that looks like 2.3 g2 is vanilla android. Cherish it! I have a question that no one can answer. What will happen when they upgrade to 21 then 42? The stick barely get 2. 3 is a rarity. And the stick should be faster than the phone. I am told that as long as you see an H the number of bars are irrelevant for speed. It is more of an indication of voice quality. I have a cell site within 5 miles. This makes no sense. My guess is that its traffic on the pipe and that you are only as fast as the slowest connection and voice takes priority over data. Thanks! However, I am talking about Rocket 2.0 and it frequently bounces between 2 bar 3G and 2 bar H+. We have had 4G in FLA for a while. That is not the problem. I can even get my BB to 5M down using BOLT or Opera Mini instead of the BB browser. Consistent 5 bars on the BB. Can you please explain how bumping to 21 o2 42 will matter in this situation? Or it could just be that those people just have a defective device because I never really had that issue unless my battery was on 5% or less around in that area but that happens with most devices when the battery is low. David – any news on the next nexus that was referred to in the following link? Forgot to mention. I’m in NYC. Just got the New market yesterday afternoon and just right now got the new system update via OTA now for my battery to charge up. received update this afternoon. phoenix az. phone seems ‘snappier’. nexus one.